Johann (Baptist) Strauss, born on 14 March 1804 was to become famous as Johann Strauss Father (or senior) and the founder of what would be known as the Strauss dynasty. At the age of seven Johann lost his mother. His father – the innkeeper Franz Borgias Strauss – remarried, and five years later he was found drowned in one of the many arms of the Danube. So at the age of twelve young Johann had lost both his parents, a fact which should not be neglected when it comes to judging his personality. He qualified as a bookbinder in 1822, although he never practised this trade. Not much is known about his musical education and his first steps as a musician. From 1823 on, however, Strauss, then nineteen years old, played in the band of Joseph Lanner, three years his senior. There is clear evidence to show that, at the latest in 1827, when he was twenty-three, Strauss formed his own band and left Lanner, probably because he thought that an independent career would bring in more money. – In 1825 he had married Anna Streim, an innkeeper’s daughter. On 25 October 1825, their first child was born. He was christened Johann Baptist Strauss after his father, and was later to be known as “ the famous” Johann Strauss (Son or junior). Father Strauss went on to play dance music with his orchestra of some twelve musicians in several inns. He did so with great success. His popularity quickly grew, and as early as 1829, aged just twenty-five, he secured for himself the post of musical director at the Sperl, then a famous establishment in the Leopoldstadt suburb. Other ballrooms were then quick to offer him engagements. Soon he could also develop his talent for organising events. Together with a team of helpers he arranged some large-scale spectacles like an evening held under the motto ‘A Night in Venice’ in the Augarten park in Vienna in 1834. In 1834 the Strauss family moved into a large apartment in the so-called Hirschenhaus, at number 17b Taborstrasse, in what is now the second district of Vienna. It was not merely where the family lived; it was here that the music was composed and copied, and it was here that the orchestra rehearsed. In fact the house, which unfortunately no longer exists, was to become the seat of the world’s first popular music business – its first popular music factory, so to speak. It was here too that the couple’s youngest child, their son Eduard, – my great-grandfather – was born on 15 March 1835. His birth completed the family of five (surviving) children. Two years after Johann, on 20 August 1827, Josef had been born; the years 1829 and 1831 had seen the births of sisters Anna and Therese respectively and then in 1835 came Eduard, the youngest of the family. But by this time the marriage was no longer a happy one. The successful, widely admired musician was already having an affair with the nineteen-year-old milliner Emilie Trampusch and their first child was born just two months after Eduard.. Eight more children were to follow. In 1833 Strauss began a series of long, well organised tours to other European countries with his own touring orchestra of some thirty players. In 1837 came his first visit to Paris. By this time his charisma and the way in which his performance on the rostrum could captivate audiences were already legendary. In Paris they included famous contemporary musicians such as Adam, Auber, Cherubini, Halévy, Meyerbeer and Berlioz. The climax of this long concert tour visit was his very successful participation in the coronation festivities for Queen Victoria in London on 28 June 1838. In 1843 he had left his family for good and moved in with Emilie Trampusch. 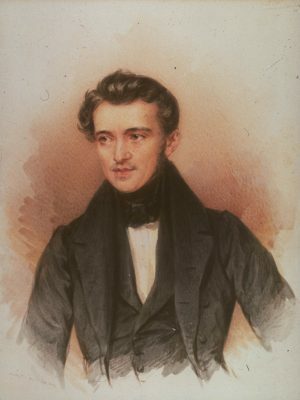 Despite of the debut of his son Johann in 1844 , the father remained the undisputed ‘waltz king’ of his time. This becomes very clear when we take a look at the father’s calendar of engagements. On this point the issue of the Theaterzeitung journal which appeared on 31 May 1845 had the following to say: Beginning next week Strauss Father will play in the following establishments: in Unger’s Casino in Hernals every Sunday, and in the Imperial-Royal Volksgarten every Tuesday and Friday, in the Odeon every Wednesday, at the Grosser Zeisig on the Burgglacis every Thursday, at the Sieben Kurfürsten in the Leopoldstadt suburb every Saturday. Strauss will keep the Mondays for himself, in order to hold magnificent festivities or charity soirées at various locations. During the revolutions of the year 1848 Johann junior certainly sympathised with his public, who tended to be young people taking an active part in these events. This is shown by several of his compositions, for example the March of the Revolution. Johann senior, on whom the title ‘kaiserlich-königlicher Hofballmusik-Direktor’ (Imperial-Royal Director of Music for Court Balls) had been conferred two years earlier – a title which had been created especially for him, wrote, among other pieces, what has become his most famous work, the Radetzky March in honour of Field Marshall Radetzky on his return from a successful campaign in Italy. But it would be wrong to conclude from that that Strauss Father was an arch-conservative and to see a political polarity between father and son, as is, regrettably, still being done by some writers. The Strausses were unpolitical people! They tried to use their music and the titles they chose for their compositions to appeal to the audiences they were going to play for. And so Strauss senior had also premiered a Freedom March as opus 226, for instance. On 18 September 1849 he conducted an ‘afternoon entertainment’ in the Volksgarten, an establishment where he very often performed. Three days later he suddenly went down with a fever. It was scarlet fever, which he had caught from the children he had had by Emilie Trampusch. He died in the night of 24 to 25 September 1849, just forty-five years old. One hundred thousand people – approximately one-eighth of the entire population of Vienna at the time – are supposed to have accompanied him on his last journey to Döbling Cemetery, where he was buried alongside Joseph Lanner after his body had previously been consecrated in St Stephen’s Cathedral. Today the site is no longer a cemetery but the Strauss-Lanner Park. The mortal remains of Strauss Father can now be found, still alongside those of Joseph Lanner, in a grave of honour of the City of Vienna in the Musicians’ Grove at the Central Cemetery. He wrote more than 280 pieces of delightful dance-music!